This Is a Very Dangerous Way To Communicate With Your Patients. I am a firm believer that you must keep up with technology and ways to automate your business, so you are being time efficient and communicating consistently with your patients. 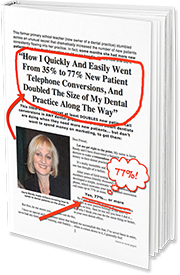 But I am deeply concerned to see too many Dental Offices relying heavily on technology to communicate with their existing patients and throwing out their face to face, one on one communication, especially over the phone. Research has shown that the very best way to effectively communicate with people is simply by talking to them. The danger of technology and automation is the loss of personalising your business. You must be very careful how far you go with technology so that you still incorporate the personal aspect of communicating with your patients. I believe technology can never replace one to one human communication, but it is important in supporting our communication with patients. The best way to covert your patient and keep your patient is to make a connection with them and build a relationship with them, and this is just not going to happen solely on an email or an SMS. Now I know your patients can be time poor and the convenience of technology and automation can overcome time issues, but please do not throw away the personalisation of human contact even with your time poor patients. Adjust the human contact to suit the needs of your patients. What you need to keep in mind is that every patient you have is a unique person who has different needs. Adjust how you communicate with your patients, while still, keeping a personal side to your communication. The one to one contact is what allows you to offer real empathy, choices and to listen to your patients to show them you genuinely care and want the very best for them. How could technology ever replace one to one human contact that provides personalisation, empathy, concern and genuine care.